Brightbulb design a local Isle of Wight design and web design business who have helped us for a number of years with our own website have just launched a online raffle in aid of the caring cancer Trust. 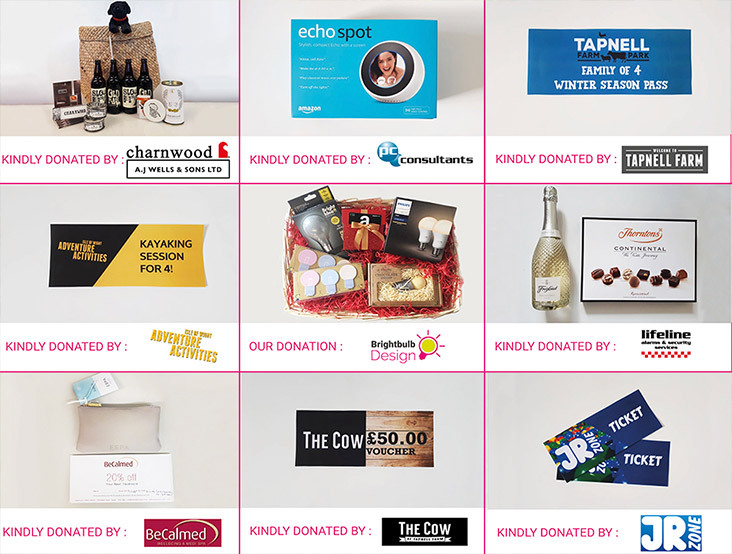 Brightbulb asked a small number of clients and local businesses if they were able to donate a raffle prize, and the response was overwhelming! To enter the raffle simply donate £2 here https://mydonate.bt.com/fundraisers/brightbulbdesign and every £2 donated is one entry into the raffle and 100% of the proceeds will come to the Caring Cancer Trust. There is no limit to the amount of entries. If you donate £10, that is 5 entries into the draw and the potential to win 5 prizes! The more you donate, the better chance you have of winning a prize, and the more you help the Caring Cancer Trust. We would like to extend a huge thank you to the incredible Island businesses that have donated these amazing prizes. Thanks to PC Consultants, Tapnell Farm, The Cow, JR Zone, Betapak, Adventure Activities, Hillbans Pest Control, AJ Wells, The Hairdresser Professor, Lifeline Alarms and Security, Dave Simon, BeCalmed, Hyphen Recruit, Pure Wight, Metro Urbane, and the Travel Counsellors for all of your amazing donations! We couldn’t have done this without your help.